That's the sentiment that surges just below the surface of Eugene Robinson's Fight – an engrossing, intimate look into the all–absorbing world of fighting. 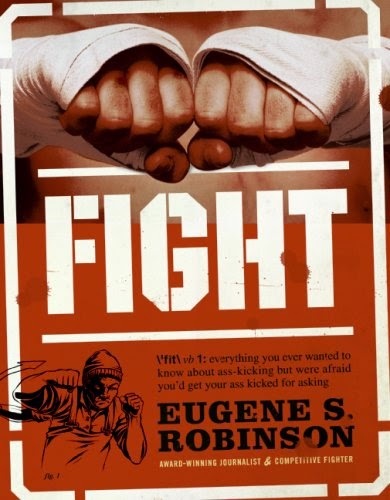 Robinson – a former body–builder, one–time bouncer, and lifelong fight connoisseur – takes readers on a no–holds–barred plunge into what fighting is all about, and what fighters live for. If George Plimpton had muscles and had been choked out one too many times––this is the book he could have written. When Robinson and his fellow fighters mix it up, they live completely for the moment: absorbed in the feel of muscles slippery with sweat; the metallic tang of blood mingling with saliva in the mouth; the sweet, firm thud of taped knuckles impacting flesh. They fight because it feels good. They fight because they want to win. And even if they get their asses kicked, they fight because they love fighting. Fight is part encyclopedia, part panegyric to fighting in all its forms and glory. Robinson's narrative – told in his trademark tough–guy, stream–of–consciousness noir voice – punctuates this explanatory compendium of the fighting world. From wrestling, jiu–jitsu, boxing and muay thai to bar fighting, hand–to–hand combat, prison fighting and hockey fights, from the greatest movie fight scenes to how to throw the perfect left hook, Fight is a scene–by–scene tour of the bloody but beautiful underworld that is the art of fighting. With his aficionado's enthusiasm and fast–paced, addictive voice, Robinson's Fight combines compelling text with beautiful photographs to create an illustrated book as edgy and interesting as it is gorgeous.